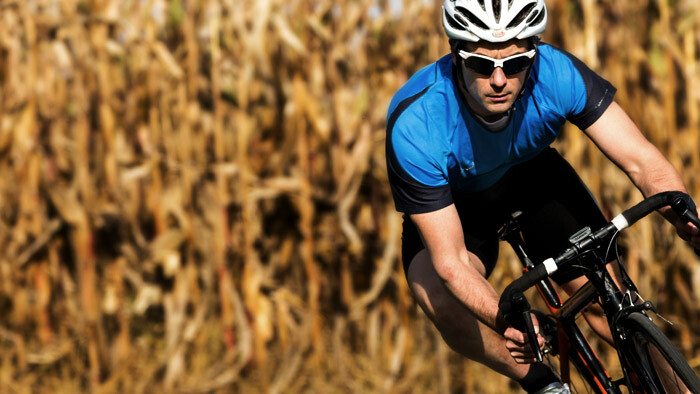 Cyclists that train with both power and heart rate zones often ask which one is more accurate. The answer? Both are valuable sources of information and have their own advantages and disadvantages. Heart rate is a good way to measure intensity but it is not as accurate as a power meter. And while power is very accurate, it is still a relative measurement to what is happening internally. So, to use both power and heart rate is ideal, but which metric is more important to focus on and when? In this article, we will discuss the roles of power and heart rate, using both to target weaknesses and strengths, and the appropriate times of the season to be focusing on one over the other. With the introduction of the power meter through the 1990’s and early 2000’s1, a new way to monitor effort, gauge fatigue and prescribe workouts was born. Power provided a precise measurement of effort which allowed coaches to view in great detail the strength of one rider compared to the other, in watts per kilogram. Up until this point, heart rate and speed were the only ways to gauge performance, which we now know is far less accurate than viewing power outputs. Power also revealed the weaknesses of using heart rate for pacing. Keeping a steady power sometimes meant that heart rate would fluctuate. So the question was asked- is heart rate a valuable metric? Heart rate training has been around since the late 1970’s2 and it is still a primary gauge of intensity for most, especially if you’re a runner. It is a great tool, but there are many variables to understand before you can use it effectively, especially alongside of power. Heart rate drift or cardiac drift is the biggest issue with using heart rate. Cardiac drift is characterized by an increasing heart rate while maintaining a steady power output. Everyone who uses heart rate and power has experienced this. But cardiac drift may not be as pronounced as once believed, especially for advanced to elite athletes. A study done in 2006, analyzing race files from road cyclists, found little to no heart rate drift for all competitions under two hours and only a 5 beat drift in heart rate for competitions from two to four hours. The comparison of this study to other studies on heart rate drift also suggests less drift happens while outdoors, where the wind helps cool body temperature and less drift happens with elite athletes3. It is important to note, that determining a proper heart rate threshold is the key to knowing whether you are experiencing a drift or not. If you determine your threshold too low, then you will experience a higher range of heart rate drift. Here is how you can test your threshold HR. Whether there is little cardiac drift or none at all, there is always going to be some disconnect between heart rate and power. When keeping one metric steady, the other will always drift higher or lower. This disconnect is called aerobic decoupling. Whether your heart rate rises with steady power or power drops with a steady heart rate, excessive amounts of this decoupling indicates a lack of aerobic endurance fitness4. 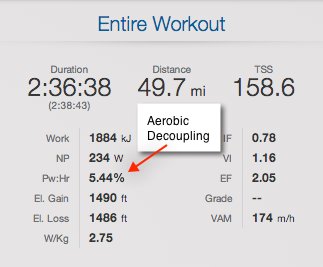 You can view your decoupling rates within each workout with your Pw:HR ratio. This ratio will vary but the lower it is the less decoupling you are experiencing. There are two ways to use decoupling within your workouts. You can work with a steady heart rate and view what happens with power, or you can focus on a steady power output and view what happens with heart rate. There are advantages with both. When focusing on producing the most power in each range and ignoring heart rate, you are going to rely on your strongest systems to do so. If you are chasing down a group ahead and working with as much power as you can, you are certainly not going to rely on your weakest systems to get you there. The advantage of working with power over heart rate is targeting your strongest systems, whether that be a big set of lungs, the ability to transfer oxygen to the muscles fast, or a strong set of muscles in the legs. This is important as you work into race season and are aiming at peaking for an event. However, working your strongest systems is only half of the training equation. Focusing on your weaker systems will help you build a stronger system as a whole. The aerobically stronger your weakest muscles and systems are, the stronger you will be when it is time to focus on your strengths. Focusing on a steady heart rate and observing power will let you challenge whichever system is weak, while not overtraining it. You can still use power to challenge yourself, working with as much power as you can, but while focusing on maintaining the heart rate range. This is important in the early season when you’re building your base endurance. So let’s put it all together and organize the year based on a power or heart rate focus. Keep in mind that through all seasons, both power and heart rate focuses will play a role. Main focus on HR, observe power, working with as much power as you can while maintaining the heart rate range. Keep your focus on power ranges while observing HR. It is important to watch feedback from heart rate and breath during zone 2-3 endurance rides. If heart rate is elevated extremely high and breath is labored, you may not be working aerobically, and may need to back off the power for the day. Stay focused on power. It is time to train your strengths at this point to prepare for your peak races. Heart rate will almost always have a delayed response to an effort compared to power, especially for short 30-60 second efforts. During recovery weeks and easy spin days through this period, it is important to focus on heart rate over power to ensure proper recovery. The importance of tracking both heart rate and power while training can not be underestimated. Understanding how these metrics work together will allow you to dial in training further than you can with just one or the other. Learn the trends with both while training, racing and recovering to ensure you are getting the most out of the time you spend on your bike.